I'm not sure when it started, but Edy's 5.8 fl oz snack cups are now labeled with a red and yellow "NEW & IMPROVED!" tag on them. I decided to go with chocolate chip because, well, I guess I'm trying to relearn some appreciation for the basics. So, here we go. Break the seal and dig in! Looks fine, chips are a bit small, but let's see how it plays out. purposely trying to find more "chocolaty" chips. they are pretty small, and add just a bit of chocolate if you catch them just right. 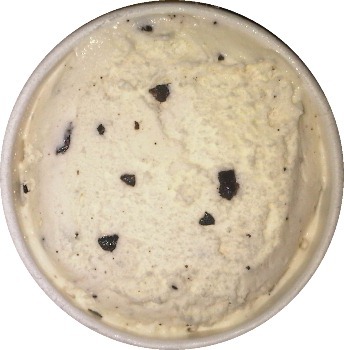 it's not bad at all, especially now that its soft and melty, we're approaching soft serve territory here. doh, and it's all gone already. 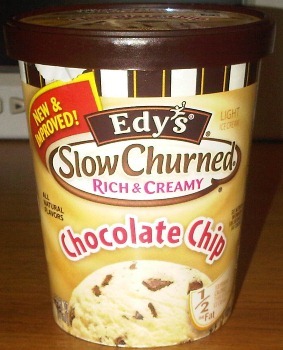 I honestly don't have any major complaints, but I definitely gave Edy's an advantage by letting it melt. Are the gummy days truly gone or did they just melt before I got to them? It would be nice if the vanilla was a bit stronger. The chips seem small, though technically I still seemed to hit them fairly often. Hmmmm, maybe these cups really are new and improved. Guess I will have to try another! say goodbye to cellulose gum, diglycerides and dextrose as they have made way for a new blend of propylene glycol monostearate, guar gum and xanthan gum. and incase I haven't made it clear, read about propylene glycol monostearate.